I have been a Rob Zombie fan since he was playing in clubs in the early 1990’s. I will say that his last concert tour for his new CDHellbilly Deluxe 2 (Featuring: What?, Sick Bubblegum, Werewolf Women of the SS) was one of the best shows I have ever seen! My wife, Michele and I saw him at the Fillmore Auditorium in Denver last November and it rocked for over two hours. The opening band was Captain Clegg and the Nightcreatures–you may have heard of them, they were in the halloween carnival scene in Zombie’s Halloween. 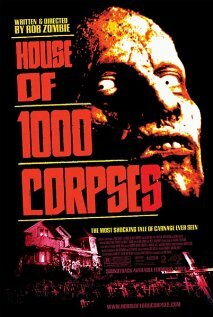 Tonight’s movie is Rob Zombie’s first full length flick, House of 1000 Corpses. Zombie has been doing a sampling of movie bits for years, Beavis and Butthead Do America (1996) and he started out as a production assistant on Pee Wee Herman’s TV show— but1000 Corpses is one of the darkest, most surreal movies I have ever seen. With a modest budget of seven million and an opening weekend of almost 3.5 million the flick catapulted Zombie as a writer/director in the horror genre and his best stuff is still to come. Plot: Two teenage couples traveling across the backwoods of Texas searching for urban legends of serial killers end up as prisoners of a bizarre and sadistic backwater family of serial killers.